When most people leave their home country in search of better work opportunities in foreign countries such as the United States, sending money remittances back to their families may be one of the biggest concerns. If you are located in the US and are looking for the best way to send money transfers back to your loved ones in Nigeria, keep reading. 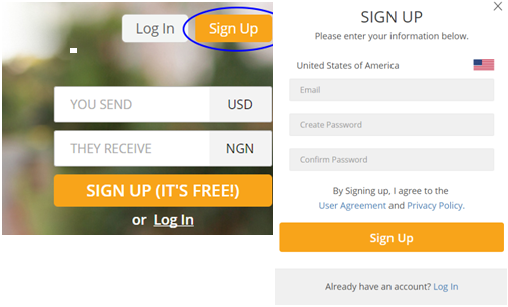 Thanks to the amazing influence of the internet and a host of other technological advancements, there are lots of ways to send money online from USA to Nigeria. This post is going to review Sharemoney.com, one of the top online money transmitters that has business in more than 20 countries and has a good reputation. Sharemoney is an online money transmitter launched in 2014. Their parent company, Omnex Group, is an international money transfer company with over 25 years of experience. After its launch, Sharemoney soon attracted lots of loyal customers who appreciate their service, and became one of the highest rated online money transfer services in the US. What are some benefits of Sharemoney? Convenience: Sharemoney allows you to send money from US to Nigeria without having to go anywhere. You can send money through Sharemoney using your mobile device, desktop, or any other devices that have an internet connection, at any time. Sharemoney is very easy to use. Customers can finish the money transfer process in minutes with only 5 steps. Speed: Usually, customers are able to receive their funds within minutes or up to 24 hours if their transfer is not delayed for security reasons. Sometimes, new users may encounter a delay in their first transfer because Sharemoney needs to verify their identity for their safety (by requesting an ID). However, for most customers the verification process is automatic and you can have your money transfer completed within a few minutes. If you want to know where your money is, their money tracker page is able to help you track your money 24/7. They also offer a 100% money-back guarantee in the event that your money transfers fail to reach your recipient, which is a unique benefit not offered by most transfer companies. Safety: Sharemoney has partnered with the best banks in Nigeria, including Zenith Bank, Diamond Bank, Union Bank, GT Bank, Ecobank, Access and more, to provide you with a smooth and secure remittance experience. Your recipient in Nigeria will receive their money quickly and conveniently in their bank account. 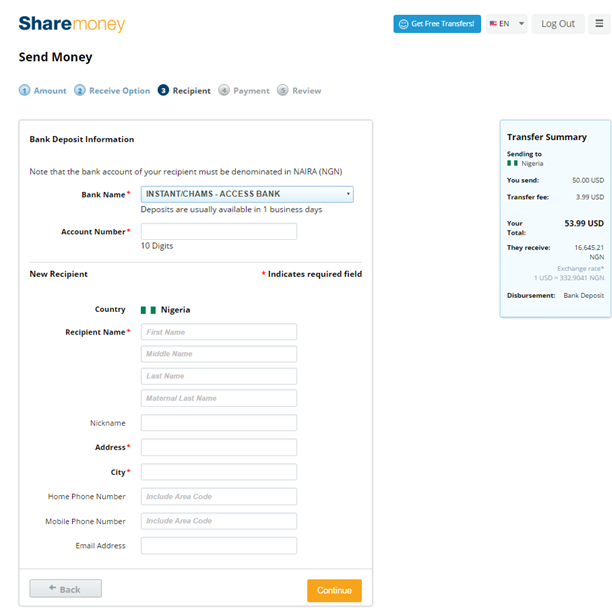 If you are located in the US and you need to send money to a Nigerian bank account, Sharemoney might be the best option for you. You can avoid the high fees you would get if you transferred through a large bank, and avoid having to go to a special location to send your money. The process to send money to Nigeria online is very straight-forward. Create a free account. Go to Sharemoney.com and click “Sign up” to create an account. All you need to do is enter your email address and choose a password. You will have to confirm your email address and fill out your personal information. Pick your country. Choose “Nigeria” from the top list as your destination country. Enter how much you want to send. There are 5 simple steps to complete. Start by entering the amount of money you want to send to Nigeria, for example, 50 USD, and the screen will automatically show how much money your loved ones will receive in NGN. Below the promo code, you can see how much money transfer fee it is going to cost you. If you have a coupon code, don’t forget to use one! It can help you save some money. Please notice, the transfer fees via debit card and credit card are different. I recommend you use a debit card to minimize the fees you have to spend on sending money. 4 . Pick which bank to send money to. In step 2, select “Bank Deposit”, and then select the bank you are going to send money to. See list of supported banks. You can see the total cost of your transfer on the right side of your screen, which includes the transfer fee. The transfer fee is flat $3.99 if you use a debit card. Please make sure all the information is correct, then click “Continue”. 5 . Pick who to send to. In step 3, Enter your recipient’s personal and bank account information to ensure your money transfer has a destination. After you’re done, click “Continue”. 6 . Pick how you will pay. In step 4, select your payment method and enter your payment information. Like we said before, we recommend you use a debit card to minimize the fees you have to spend on sending money. With debit cards, the fee is always $3.99, while credit cards can have higher fees. After all information entered, select “Continue”. After reviewing your order and making sure all the information is correct, click “Pay and Send”. You’ve successfully sent your money to your loved ones in Nigeria! Sharemoney team will review your money transfer and make sure your recipient gets your money as soon as possible! 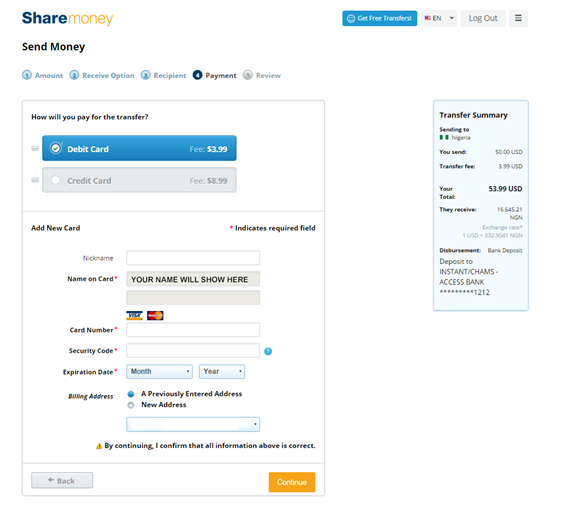 For anyone looking for a quick and simple way to transfer money from USA to Nigeria, give Sharemoney a try. It will save you money on fees and provide a fair exchange rate, while allowing you to send funds directly into a Nigerian bank account without a hassle. We Accept Sponsored Post Or Review Post On This Site. 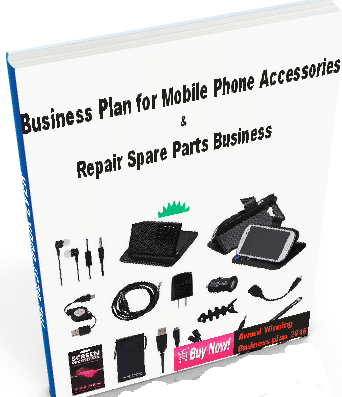 So, If You Have A Product, Company Or Website You Want The World To Know About, We Will Help You Spread It. Visit Our Sponsor Post Page for More Information Or Contact Us @ immax2005@gmail.com.